The United States Congress designated the Mount Rainier Wilderness (map) in 1988 and it now has a total of 228,480 acres. All of this wilderness is located in Washington and is managed by the National Park Service. 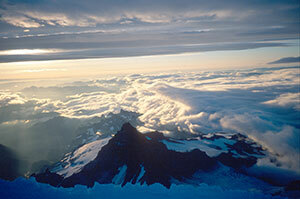 The Mount Rainier Wilderness is bordered by the Clearwater Wilderness to the north, the William O. Douglas Wilderness to the east, the Tatoosh Wilderness to the south, and the Glacier View Wilderness to the west. Mount Rainier Wilderness is located on the west-side of the Cascade Range, approximately 50 miles southeast of the Seattle-Tacoma metropolitan area. At 14,410 feet, Mount Rainier is the most prominent peak in the Cascade Range. It dominates the landscape of a large part of western Washington State. The mountain stands nearly three miles higher than the lowlands to the west and one and one-half miles higher than the adjacent mountains. Twenty-six named glaciers spill down the slopes, covering approximately 37 square miles, making it the most heavily glaciated peak in the contiguous United States. Mount Rainier is an active volcano that last erupted approximately 150 years ago. The distinguishing aspects of this Wilderness only begin with the mountain. Mount Rainier Wilderness is part of a complex ecosystem. Vegetation is diverse, reflecting the varied climatic and environmental conditions encountered across the area's 12,800-feet elevation gradient. Species known or thought to occur in the park include more than 800 vascular plants, 159 birds, 63 mammals, 16 amphibians, 5 reptiles, and 18 native fishes. The Mount Rainier Wilderness contains 26 named glaciers across 9 major watersheds, with 382 lakes and 470 rivers and streams. Planning to Visit the Mount Rainier Wilderness? How to follow the seven standard Leave No Trace principles differs in different parts of the country (desert vs. Rocky Mountains). Click on any of the principles listed below to learn more about how they apply in the Mount Rainier Wilderness.